I'm sure her input will be greatly missed. bigD111, Frigg, mountain man, Rick Farias, SlowLoris, SouthernBelle, WNC likes this! He would have carried her to the hospital. Fossy, Frigg, Ghost Shadow, Moon Rocks, mountain man, Scent of Cedar, WhiteAngel, WNC likes this! Trump must have had Jared poison her jew-stew. bigD111, Frigg, Moon Rocks, WhiteAngel likes this! Frigg, Heir, Kels, Moon Rocks, Weasel Keeper likes this! Heard on the radio that POTUS was supposed to go to the court today for a ceremony for kavannaugh? Anyone else hear this? 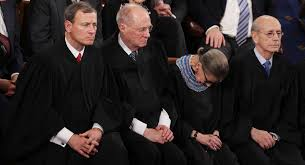 (11-08-2018, 10:17 AM)Talon Wrote: 85-year-old Supreme Court Justice Ruth Bader Ginsburg has reportedly been hospitalized after fracturing three ribs in fall at court. Couple of cups of infant blood and she will be back to work in no time. (11-08-2018, 10:18 AM)WhiteAngel Wrote: I first saw her face and thought she had passed. She is so frail looking that I think we all expect her to pass any time now. That's what the justice on the right was thinking. This was taken during a speech by Obama. bigD111, Frigg, WhiteAngel, WNC likes this! Mark Taylor said three would go . This is one of three with two left. We'll see. Fossy, Frigg, Scent of Cedar, T-Dub, WhiteAngel, ~mc~ likes this! (11-08-2018, 10:21 AM)bigD111 Wrote: Pneumonia can be an issue after this injury! That is entirely possible. It depends on whether or not her lungs can move the amount of fluids that are normally present without restriction. Pain medication for her will be touchy because many of them suppress the respiratory drive. She's 85 yrs old and we don't really know the status of her overall health. I don't think she will resign though unless God makes that decision for her. bigD111, Frigg, Karu, Lily, T-Dub, WhiteAngel likes this!